is there option in canon 870 to reduce or increase the flash intensity? it is too bright while taking pictures of my newborn. I assume that you mean the Canon SD870IS camera flash. I don't find any way to manually adjust the flash intensity. If the room is well lit, the flash intensity will be less. If it is daytime, in a room with a window near the child, the camera will use much less flash. I don't recommend that you use flash with a new born, if the baby has it's eyes open. I have used the flash if the baby's eyes are closed. And newborn babies have their eyes closed most of the time anyway. You can try a light deflector. Tape some card stock over the flash so that you can bend the card stock enough that it deflects the flash upward at about a 45 degree angle. This also gives a softer light. The other option is to turn the flash off. But if you are indoors, you will need to put the camera on a tripod to prevent camera movement, as the exposure time will be close to a second (maybe more). i am using my camera now to take photos of my new born. So don't want wide angle 28mm. i need 35mm only. how to swtich to regular angle instead of wide angle. We want to help you, but what do you mean? When you zoom out you go to the focal range of 28mm and when you zoom in you increase the focal range. Here is a visual that maybe can help you with understanding focal ranges. You can move the red slider by hitting tele or wide buttons. That camera has a 28mm focal length when it is not zoomed at all. That is considered wide angle. I recommend that you zoom all the way out and then use your feet (back-up) to frame the baby for the shot. Wide angle portraits will distort the features of the face. 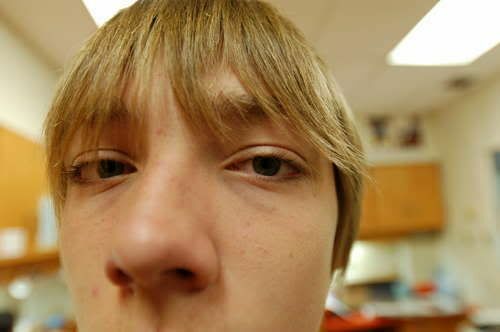 The most common is the appearance of an enlarged nose. so i have to zoom in 2X and step back and trigger to get a photo equivalent to 35mm. u have typed as zoom out. was that typo mistake? 50mm focal length is generally considered as photographic neutral. It is neither wide-angle nor zoom. That would be about 2X zoom on your camera. Just about all of the old 35mm film SLR cameras came with a 50mm lens. Most photographers recommend a bit of zoom when taking portraits. So setting your camera to 3X would be OK also. You just move yourself and the camera to frame the shot. "Before there was zoom, there was feet."